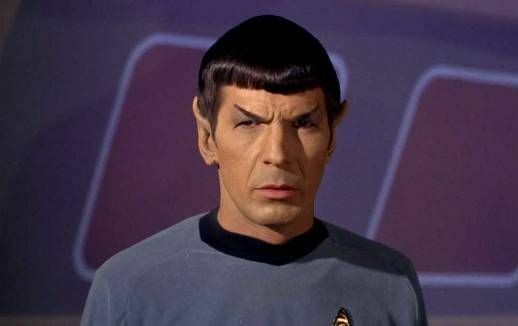 Spock was born on January 6th, 2230 in the city of Shi'Kahr on the planet Vulcan. His mother was Amanda Grayson, a Human school teacher, and his father, Sarek, was a Vulcan scientist and diplomat. For a time, Spock grew up alongside his half-brother, Sybok (the son of Sarek from a previous mate) until Sybok was ostracized for rejecting Vulcan principles of logic and choosing to embrace emotion. Spock's mixed parentage caused difficulties throughout his early life. His own father, despite having married a Human woman, was somewhat ambivalent about his son's half-Human nature at his birth. For her part, Amanda watched Spock's stiff-lipped anguish caused by torment at the hands of other Vulcan children, who repeatedly attacked and teased him to provoke emotional responses, knowing that his "Human half" was suffering. As a child, Spock was betrothed to T'Pring, in accordance with traditional Vulcan marriage procedure. In 2237, at the age of seven, Spock decided (prematurely, and without parental knowledge or approval) to undertake the kahs-wan maturity trial in the Vulcan wilderness in an attempt to prove himself. His pet sehlat, I-Chaya, tagged along against his master's wishes, and defended Spock from the attack of a carnivorous, venomous le-matya. The intervention of an older cousin saved Spock from the le-matya, but I-Chaya was left badly wounded. Faced with the stark choice of a painfully extended life or a peaceful release for I-Chaya, Spock logically opted for the latter. That decision marked his choice of following in the philosophies of Surak: logic and emotional control. Many years later, in 2269, the accidental creation of an alternate timeline created a universe where Spock was killed in his childhood. Using the Guardian of Forever, Spock returned to the Vulcan of his youth and assumed the role of Selek, the nearly-forgotten cousin who saved his life during the kahs-wan ordeal. Sarek gave Spock his first lessons in computers, setting him on the path of a scientific career. Against his father's wish that he complete his instruction at the Vulcan Science Academy in the family tradition, Spock expressed a desire to join Starfleet. The argument came to a head in 2250 with Spock's final decision, causing a rift that kept them from speaking to each other for eighteen years. As a science officer under the command of Captain Christopher Pike, Spock was wounded in the leg when Pike's landing party was attacked on Rigel VII in 2254. As the ship proceeded to the Vega colony for medical care, a radio wave distress call forced Pike to divert the ship to Talos IV. Still limping, Spock joined a landing party that transported to the barren surface of the planet, where Talosians captured Pike; he was the first of the ship's crew to realize that the Talosians had powerful illusory abilities. Spock's final report, along with Pike's, recommended a ban on visitation to the planet. Starfleet's General Order 7 supported that judgment. On Earth briefly in 2261, Spock met Leila Kalomi. Although she declared a love for Spock, his Vulcan control prevented him from showing any emotion in return until the spores on the planet, Omicron Ceti III, infected him. Under their influence, he became peaceful and happy, but Captain Kirk infuriated him, thus killing the spores and returning him to reality. Spock's service under Pike (eleven years, four months, and five days) inspired considerable respect and loyalty from the young officer. In 2267, Spock risked his life and career for the sake of his former captain. After Pike's promotion to fleet captain, James T. Kirk assumed command of the Enterprise in 2265, with Spock as his First Officer. An early mission, attempting an extra-galactic probe, was disastrous. Lieutenant Commander Gary Mitchell, a close friend of the new captain, developed enhanced psionic abilities when the Enterprise encountered an energy barrier at the edge of the Milky Way Galaxy. Spock examined the tapes of an earlier ship, the SS Valiant, that had encountered the same barrier and was destroyed. As Mitchell's powers increased geometrically, Spock believed he had become extremely dangerous and feared that he would destroy the ship. Spock therefore advised Kirk to either strand Mitchell on the uninhabited, desolate world of Delta Vega, in order to isolate him from galactic civilization, or kill Mitchell before it was too late. Kirk hesitated, and initially attempted the former, but the scope of Spock's concerns were eventually borne out, and Kirk was forced to kill Mitchell. The Enterprise repelled the first Romulan incursion of Federation space in over a century on stardate 1709.2. Spock and the bridge crew became the first Starfleet officers to make visual contact with Romulans, who finally revealed their Vulcan-like appearance to Starfleet. Lieutenant Stiles briefly suspected Spock of being a Romulan agent until Spock saved his life in the course of battle. Spock kidnapped Fleet Captain Christopher Pike, his former commander, and hijacked the Enterprise. Pike had been crippled when a baffle plate ruptured during an inspection of an old Class J starship and was confined to a wheelchair, unable to speak. Spock wanted to return him to Talos IV, where they had visited years earlier; he wished to return Pike to the Talosians there so he could enjoy the rest of his life in an illusory reality and would not have to continue enduring his disability. After a lengthy inquiry into the matter, and in light of the Talosian-provided images, Kirk allowed Pike to beam down. Commodore Jose I. Mendez also dropped all charges against Spock. While commanding an away mission aboard the Galileo on stardate 2821.5, the shuttlecraft crashed on the surface of Taurus II. Giant hostile creatures killed two crewmembers while the shuttle was stranded there. Spock, aided by Lieutenant Commander Montgomery Scott, eventually launched the shuttle. Knowing that it could not break free of the planet's gravity, Spock ignited the shuttlecraft's remaining fuel, using it as a flare. The gamble paid off, it alerted the Enterprise, which turned around and rescued the team. After being thrown back in time to Earth of 1969 and interacting with that planet's US Air Force, Spock was able to recreate a time warp with a slingshot maneuver around the sun. Later, when Kirk was court-martialed for causing the death of Lieutenant Commander Benjamin Finney, Spock proved that Finney had altered the Enterprise's computer tapes to frame Kirk. Spock, along with Kirk, helped disable a computer that controlled the lives of a civilization on Beta III and allowed no free thought or creative thinking. Spock helped Kirk to retake the Enterprise after Khan Noonien Singh, a 20th century Augment dictator whom the Enterprise's crew had found in stasis, commandeered the starship. Spock flooded the ship with gas, disabling Khan and his followers. On stardate 3192.1, Spock and Kirk were taken prisoners on Eminiar VII, which had been at war for over five hundred years with the planet Vendikar. Computers fought the war virtually so that the destruction of actual warfare did not devastate the two worlds, thus preserving both civilizations. Whenever the computer registered a hit, the affected citizens reported to a disintegration chamber and were vaporized. When the Enterprise entered orbit around Eminiar VII, it became a legitimate target for Vendikar. The war computer soon declared that a tricobalt satellite explosion had destroyed the Enterprise; as a result, Eminiar officials expected the crew to report to the disintegration stations. They abducted Kirk and Spock to ensure compliance, but the two escaped captivity and destroyed the computers on Eminiar VII. With the threat of a real war looming over the inhabitants of both planets, Spock and Kirk sought to negotiate a peace between Eminiar VII and Vendikar. Later, on the mining planet Janus VI, an unknown creature was killing miners there. After locating the creature, Spock mind-melded with it; he discovered that the creature was called a Horta and determined that its killing of the miners was an attempt to protect its young. The miners had been unintentionally killing the Horta's offspring by destroying silicon nodules which were really the creature's eggs. Spock negotiated a pact between the Horta and the miners: The miners would leave the eggs alone and the Horta, in turn, would help the miners locate valuable minerals. Spock and Kirk later became trapped on Organia, a planet of medieval culture, during a Klingon occupation of the planet. The Klingons wanted to use Organia as a base in their war against the Federation. The Organian council refused the Federation's help, and after the Klingons invaded and took control of Organia, Kirk and Spock had civilian identities imposed on them, with Spock being given the identity of a merchant. They then became involved in sabotage. After the Klingons captured them, the Organians set Spock and Kirk free. Just as war began to break out, the Organians revealed themselves to be powerful energy beings, once humanoid but now evolved. They neutralized both sides weaponry and stopped the war. On stardate 3134.0, Spock and Kirk traveled back in time using the Guardian of Forever to retrieve Dr. Leonard McCoy. McCoy had entered the time portal and somehow changed history. Spock discovered that McCoy changed history by saving the life of Edith Keeler, a social worker who, in the altered timeline, led a pacifist movement that delayed the United States of America's entry into World War II, thus allowing Adolf Hitler to win the war. Spock persuaded Kirk that allowing Keeler to die in an auto accident was only way to restore the timeline. Near the end of the year, a neural parasite that destroyed the colony on Deneva also attacked Spock. He submitted to an experiment that destroyed the creature inside him but also left him blind. However, the blindness was only temporary due to an inner set of eyelids that all Vulcans possess. In late 2267, the Enterprise encountered a probe called Nomad that had destroyed multiple star systems and their inhabitants. Spock mind-melded with the probe and discovered that it was an old Earth probe originally tasked with seeking out new life. Somehow damaged in space, it had merged with an alien probe on a mission to sterilize "imperfect" biological organisms from soil. These two missions had merged into sterilizing or improving anything that was not "perfect." Using its own logic against it, Kirk destroyed the probe. During an encounter with what was known as the planet killer the Enterprise with Spock on it was transported to a different quantum reality and the year 2379. When Captain Kirk was transferred to the Enterprise-E the Enterprise was converted to a training ship and Spock was given command.